As aggressive and dominant as its namesake, Raptor provides superior performance and cosmetics at entry-level price points — a mission based upon our belief that "affordable" and "cheap" installation accessories shouldn’t be one and the same. 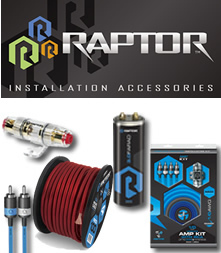 Raptor products are developed and overseen by an in-house staff of mobile audio professionals with years of experience in design, engineering, installation, competition and automotive development. Our economy of scale in the industry allows us to provide an upgrade hardware experience at an exceptional value. All materials are first quality, right down to the 24K gold plating for plugs, connectors and terminals. The result: leading-edge accessories that deliver true-to-spec performance, with a degree of style typically reserved for premium-level brands.